TakeOff Centre is one of Takeoff Projects. TakeOff Centre supports startups that have outstanding IT technology and business plans with the following. Management, market trend surveys, and legal support. Technical support such as AI, Search Engine, and Blockchain. The business is eco-friendly and maintains sustained growth. The project we support is designed so that the added value of the project can be more than 20 times from the time of token sale within several years by a consultant who made grand-designs at large companies. Taking Off like a rocket. These are the wishes put in the logo. This is a huge project! Search Engines for sightseeing, shops, etc. This project provides search engines that can search regional information such as sightseeing spots, shops, and area news etc. The goal of this project is to realize a search engine that seems as if you are walking while enjoying the atmosphere of the city, yet you have never been there before you can tell secret spots that local people only know. If you use this service, before you move to an unknown town or before you go on a trip, what kind of landscape the town is lined with, what kind of shops are lined up, what kind of sights are there, somehow, you can know the atmosphere of the town. Even if you are a locally living person, you will discover what kind of menus and goods the shops in the back place are offering, and rediscover the charm of the local. People have limited places to actually go out during their lifetime. It is a wonderful experience that you can experience a simulated experience of visiting various places in the world, staying at home with this service. 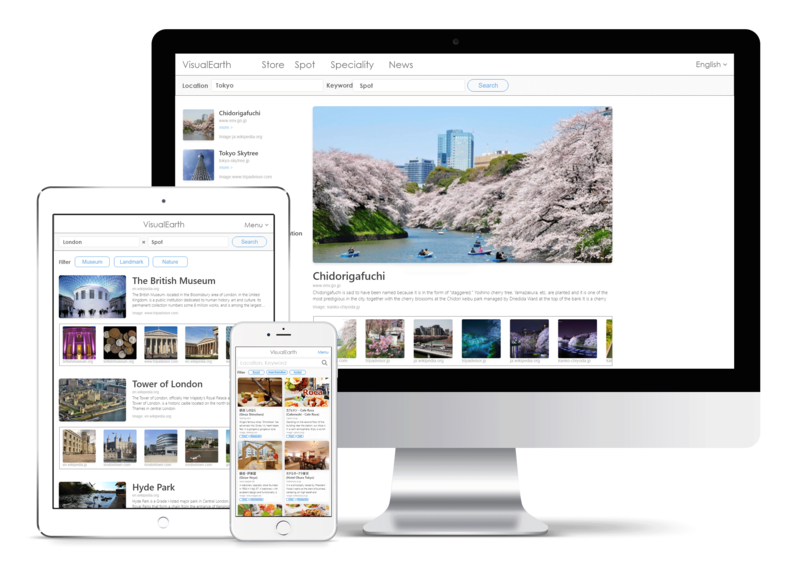 In the search results of this service, you can see the atmosphere of the shop and the atmosphere of the town by a large number of images like menu, the appearance, interior decoration of shops on a search result page. 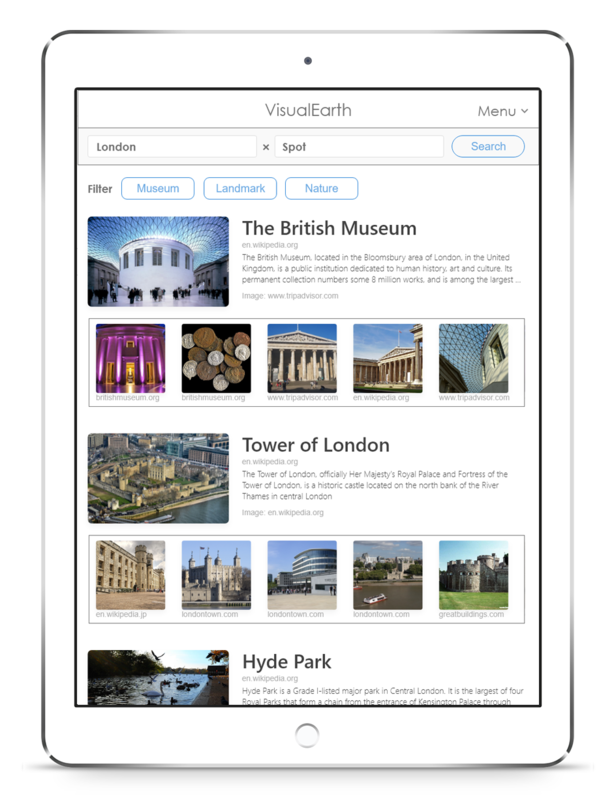 In the sightseeing spot search, the search results are displayed with a slide show. It is planned to enrich VR contents. You can also view the search results on the map. 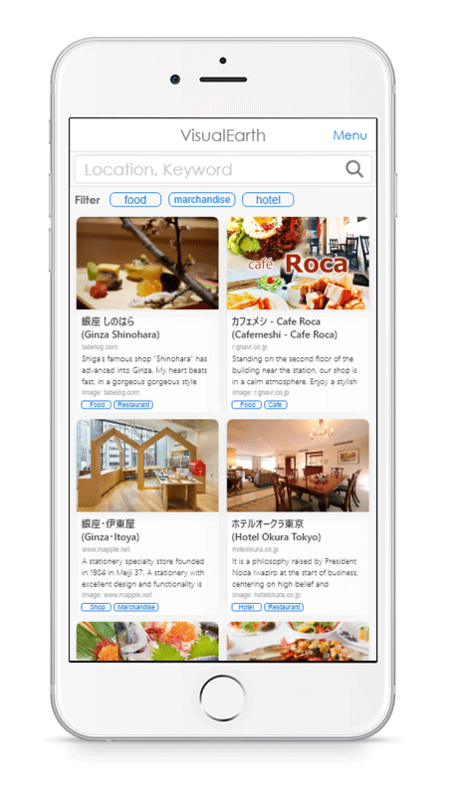 In addition, while searching for sightseeing spots and shops, this automatically judge and display relevant contents (wikipedia and sightseeing information explaining culture and history) such as regional culture, food culture, history etc on the same screen. These have been made possible by crawling technology that acquires structural information, natural language processing and AI technology which correlate information distributed among multiple sites. In order to fulfill the responsibility of the search engine as a social infrastructure, the information gathered from the Internet is clarified and guided to the source website. In addition, we will ask users to contribute content through token economy, and thus we provide more attractive services. This service provides opportunities for shops and business owners to be exposed. When there are shops and business establishments in the back place, it is often difficult to have the world know about their services. In the service dealing with "regional information", in principle, the search results are displayed in the order closer to the position of user or the position to be searched, based on the absolute standard "position". This means that there is a possibility that all shops and business establishments will be displayed on top of search results. If owners can represent the service of their shops visually and attractively with pictures, they will be able to attract users strongly. Posting content to this service can be a hospitality to their potential customers. A part of the prototype of this project has already been completed, and it is under further development now. VisualEarth's token design (token economy, distribution) is currently being formulated by strategists. The start date of the IEO will be decided by looking at the state of the cryptocurrency industry. This project is a human resources matching service that uses AI to find talents needed by companies. AI analyses data registered by people who are looking for work, and data made public by individuals, such as social media and blog posts, and source code. Securing excellent talent is essential for success in projects. Naturally, matching the rewards and skills alone is not enough in the present era when the values of individuals are diversifying. However, it is difficult to fully grasp the skills and the personality of each person just by looking at the resume or by having an interview with candidates. Also, candidates have difficulty grasping the company’s work environment and culture. In addition to registered data, this project analyses published data, visualizes actual results in a user-friendly manner, and presents them to companies. People searching for jobs can control how much information they publish for each company that has made offers. Also, it is possible to choose good work from among the recommended companies that match each characteristic and direction analysed by AI. In the long term, this project will create good relationships satisfying both companies and workers, aiming to stabilize employment. The Slide of the project is comming soon. IEO Start: To be determined. This project provides news and indicators that are expected to affect market overall, stock prices, and virtual currencies. AI analyses news, social media, stock price, and virtual currency value fluctuations in real time. When important news or signs are detected, this service will notify you by the mobile app’s push notification or e-mail. This system automatically trades by AI to maximize profits using API of exchanges (including TakeOff Exchange). Not only natural language processing is applied to news and text on social media, but also machine learning is applied based on the impact of each news article on stock prices and virtual currency trends, leading to improved accuracy. This project is an investment analysis tool. It does not anticipate purchasing advice on individual stocks or virtual currency or price movements of stock prices or virtual currencies. Currently, AI to be incorporated in the prototype is under development. This project provides a system that allows customers to easily settle items and services with multiple tokens and virtual currency. TakeOff tokens can be used to pay the service use fee of startups. However, immediate settlement or settlements of small amounts may be required depending on the services of the startups. At that time, TakeOff tokens issued on the Ethereum may become difficult to use in terms of settlement speed and settlement fee. Similar inconveniences will be encountered by businesses other than startups supported by the TakeOff Centre. It is fascinating that next generation Ethereum technologies and payment systems integrating multiple blockchains like TenX are under development. We will decide whether to adapt optimal platform technologies or develop them independently while seeking realistic demands desired by startups or general business operators, and assessing the progress and technology of various blockchain projects. In order to make multiple practical tokens that can be used for actual settlements, we plan to implement ICOs to develop our own platform and/or develop user-friendly interfaces. It is currently under design. 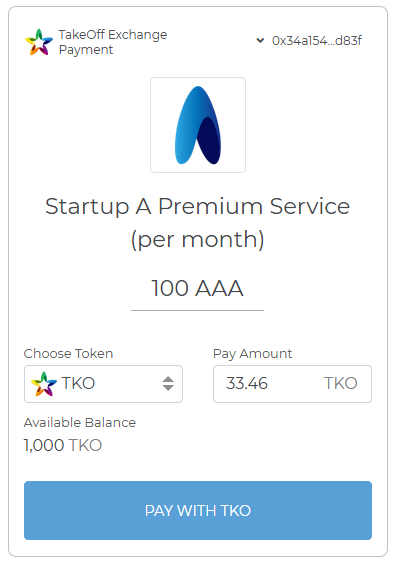 TKO token is implemented as a utility token for service fees provided by startups supported by TakeOff Centre. The more startups "takeoff" from TakeOff Centre, the more value TKO token gets. The TKO token can be used in TakeOff News Search and TakeOff Exchange. TKO token will be one of base assets on TakeOff Exchange. TKO with USD / BTC / ETH on P2PB2B the top 30 exchange with legal registration in EU. TKO with USD / BTC / ETH on Alterdice. 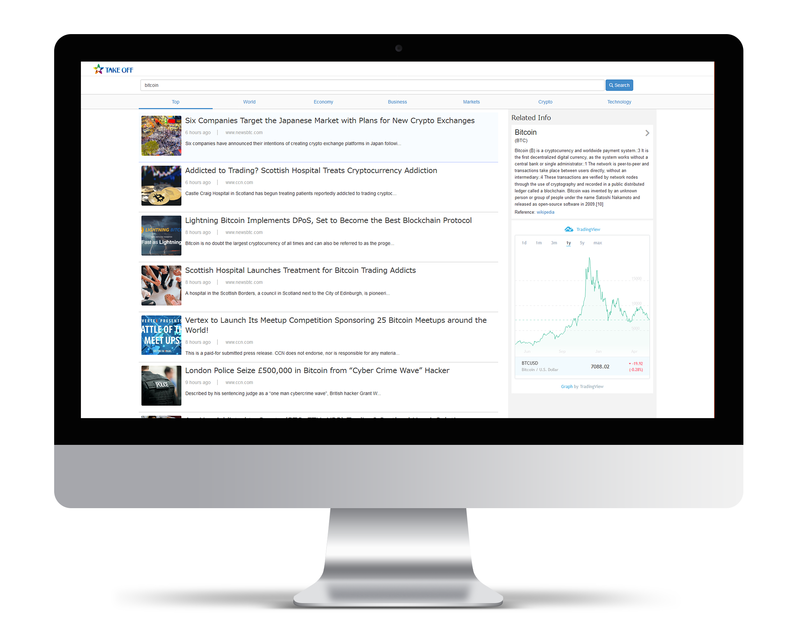 TakeOff provide investors with useful tools by TakeOff News Search. Connect investors and startups at TakeOff Centre. Provide a place for trading original tokens issued by startups at TakeOff Exchange. Furthermore, startup’s services make mutual utilization of the original tokens via TakeOff Exchange Payment (Decentralized Multi-Token Payment), and increases the liquidity and the value of each token. Please cheack TakeOff Projects' site, and read our whitepaper. Copyright © TakeOff Technology OÜ. All rights reserved.